ZyXEL GS1100 Series 8-port GbE Unmanaged Switch. The ZyXEL GS1100 Series is the best solution for instant Gigabit connectivity in office environments demanding silent operation and better energy efficiency. With power-saving functions, Gigabit Ethernet and a fanless design, the GS1100 Series provides plug-and-play simplicity for high-bandwidth network applications. The ZyXEL GS1100 Series consists of four unmanaged switches: the GS1100-8HP, GS1100-16, GS1100-24 and GS1100-24E. The GS1100-16 and GS1100-24E feature 16 and 24 GbE ports. 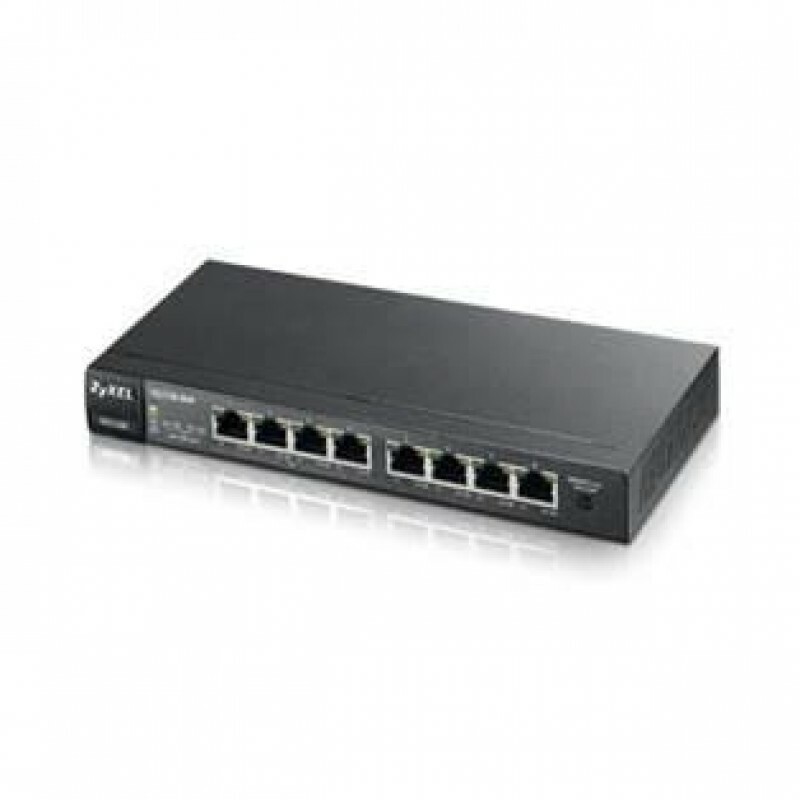 The GS1100-24 is a 24-port Gigabit switch with 2 additional open Gigabit SFP slots, while the GS1100-8HP is an 8-port Gigabit switch that complies with the IEEE 802.3at Power over Ethernet (PoE) Plus standard, providing 4 PoE ports with up to 30 watts per port. The complete GS1100 Series comes in a fanless design that ensures silent operation in small or quiet office environments. The GS1100-8HP PoE model is specifically designed with an external power adapter that eliminates the need for an additional fan to cool down the device, making it perfect for quiet PoE deployments. The ZyXEL GS1100 Series offers small offices 8/16/24-port Gigabit connectivity at the most competitive price. Additionally, the GS1100-24 model is equipped with 2 extra SFP slots, supported dual rate (100 M and GbE speed) that enable fiber optic connections for long-distance deployments. With Gigabit network performance and high cost-effectiveness, the GS1100 Series is the ideal solution for bandwidth-intensive applications such as high-resolution photo transmission, video/audio streaming and server farm connections. The GS1100-8HP supports the IEEE 802.3at PoE Plus standard to ease the installation of network devices in challenging spaces such as ceilings or walls. The power supply of up to 30 watts per port allows the GS1100-8HP to power PoE-enabled WLAN APs, VoIP phones and IP surveillance cameras through CAT-5 cables of less than 100 meters (300 feet) in length. With the ZyXEL GS1100-8HP, there is no need for extra power adapters in installing PoE devices in difficult locations. This feature helps enterprises reduce installation time and cost when there are many such devices on the network.